These beautiful eggshell designs have been designed for all types of eggs. With over 100 designs in this collection. These can be used on Goose eggs, Emu egg, Reah, Ostrich, quail and more. These exclusive designs are elegant and amazing. These will give you the edge when using the Power Carver or the 400xs high-speed engraving systems. These designs can be used with our unique stenciling sheets. 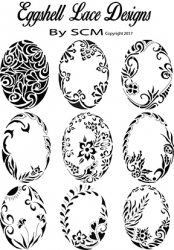 Simply print the designs onto the sheet and apply to the eggs and just trace. These are not on a CD.... These are on paper only.